Earlier this month at Mobile World Congress, we and our partner Thinfilm and customer Diageo unveiled a prototype smart whisky bottle. 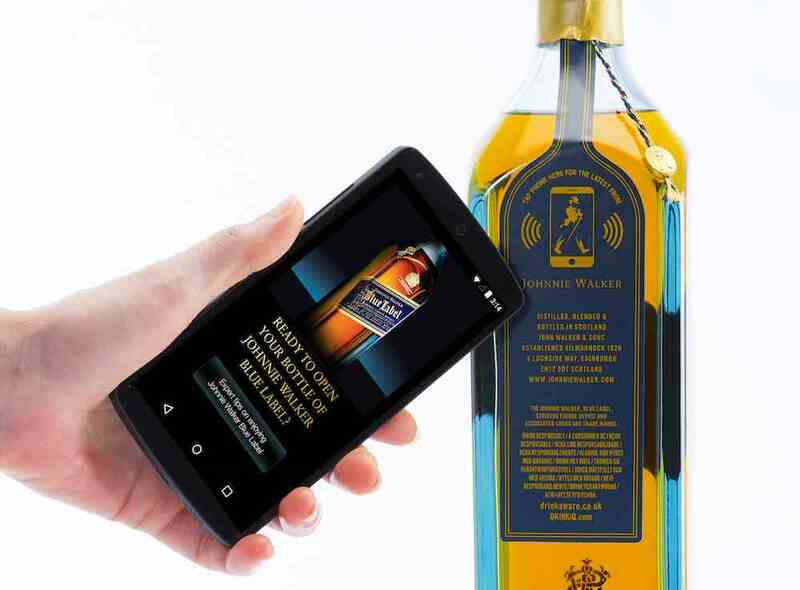 The prototype combined our IoT smart products cloud with Thinfilm’s OpenSense™ printed NFC tag and Diageo’s premium whisky brand Johnnie Walker Blue, and demonstrated the business value of connecting a CPG product that’s smart enough to determine whether the consumer is pre- or post-purchase, and to engage them accordingly with relevant content. The joint solution offers end-to-end intelligent product solutions that combine real-time cloud software with smart packaging hardware powered by printed electronics technology. This unique combination can extend the boundaries of the Internet of Things to include billions of everyday items, including consumer goods, food and beverages. In the case of the Johnnie Walker Blue bottle, we focused on the OpenSense™: a new Thinfilm NFC tag that detects whether a bottle has been opened, and delivers content designed to engage the consumer based on a series of rules in the EVRYTHNG platform, based on variables that include whether the bottle is closed or open. However, the joint solution offers even broader commercial applicability. Thinfilm’s range of printed electronics products (including pressure-sensitive NFC & sensor-based smart labels), combined with the flexible, programmable rules engine in EVRYTHNG’s IoT Smart Products Platform, enable cross-industry solutions that include personalized marketing and offer customization; brand authentication and anti-diversion; product serialization and asset management; and track-and-trace monitoring.